You could be serving up too much of the sweet stuff. Here’s why you should be quenching your toddler’s thirst with options other than fruit juice. The Canadian Paediatric Society (CPS) recommends that children from six to 24 months drink no more than four to six ounces (125 to 200 mL) a day, and children two to 12 years old drink no more than eight to 12 ounces (250 to 375 mL) a day. In other words, parents should limit juice intake to two servings daily. "Parents have a tendency to offer juice more often than not," says Toronto dietitian Lorry Chen. "Kids love juice and will ask for it, again and again. Most parents aren't even aware that overconsumption is an issue. They think it's nutritious, so why not offer it all the time?" That's the catch: Juice is nutritious. 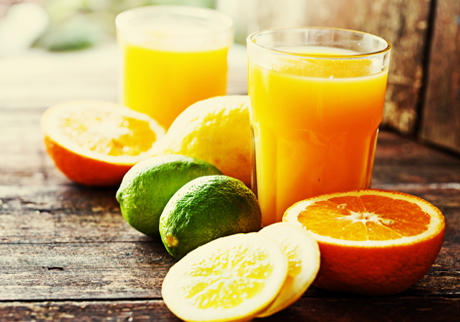 Most varieties are excellent sources of vitamin C. Depending on the type, juice can also supply folate, potassium – even vitamin A and calcium. It's fat-free, easy to digest, has no additives and is all-natural. Yet, despite all of its positive attributes, juice is high in sugar and calories and tends to fill up small tummies quickly. If your little guy is feeling satiated from a juice bottle, chances are he won't want his lunch. There's another concern. Too much juice – especially apple or pear juice – can sometimes lead to watery stools or toddler's diarrhea. Different than infectious diarrhea, toddler's diarrhea occurs when too much sorbitol and fructose enter the digestive tract. "These sugars are not broken down easily in a young child's digestive system," explains Doris Yuen, chairperson of the CPS Nutrition Committee, "and as a result, water actually leaks into the gut, causing diarrhea." Another place to avoid juice is in a bottle. When children drink juice from a bottle, teeth are in constant contact with sugary liquids, wreaking havoc with dental health. According to Burton Conrod, a dentist in Sydney, N.S., children who spend a lot of time with a bottle of juice, milk or formula in their mouth – whether lying down or walking around – are at risk of suffering from severe tooth decay (unless, of course, that bottle is filled with water). Thus it is better to drink juice from a sippy cup or juice box in a single sitting rather than throughout the day, to limit the contact time between teeth and sweet fluids. Since most juice hounds complain loudly when parents try to cut back, it's wise to do so gradually, perhaps over a month. Reduce the actual serving size, too, or consider diluting it with water. And, if you instill some structure, such as, "We only serve juice at breakfast," or "Here's your daily juice snack," then the all-day habit never starts.